Andharban near Pune is a part of the Sahyadri range that connects Tamhini Ghat to the Konkan region. Andharban Trek means dense dark forest. It starts with descending a Beautiful Valley which takes almost 4 hours to reach ending point of Trek. There you can see an awesome view of Kundalika Valley & Bhira Dam. 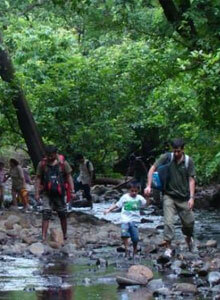 The route of Andharban trek is a pleasurable walk through the deep forest. 09.30 pm Leave from Pune, Fergusson college main gate. 12.00 am Reach to Andharban. 12.30 am after introduction and briefing, start trek. 03.30 am Start descend towards bhira dam, konkan. 07.30 am Reach to bhira dam. 08.00 am Reach to base village, freshen up. Transport from Pune to Pune by Private vehicle. Mineral Water, Cold Drinks, Snacks etc. Anything not mentioned in the what’s included list.